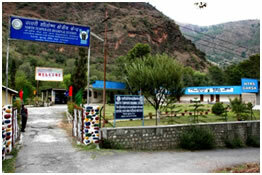 The North Temperate Regional Station (NTRS) of the Institute was started at Garsa, Kullu valley of Himachal Pradesh with the mutual collaboration of Ministry of Food and Agriculture, Government of India and erstwhile Punjab Government (subsequently Himachal Pradesh) as a Sheep Breeding Farm in the year 1963 to look after the region specific research for improvement of sheep. Later on the station was transferred to the Indian Council of Agricultural Research (ICAR) and functioned as the Regional Station of Institute for North Temperate Region of the country. This station is located at global position of latitude 31° 34' 47.9994" N (31.58° N) and longitude as 77° 12' 0" E (77.20° E) with average annual rainfall of about 840 mm in Himalayan Kullu valley. This station is located at 1400-2100 meters above mean sea level on the right bank of Garsa stream.